It’s been awhile since I did a giveaway from my shop, so I thought it would be fun to do a Spring Necklace! This contests is called the ABC’s of flowers. For a chance to win this lovely necklace, please name 3 flowers, one beginning with an “A”, one with a “B”, and one with a “C”. Then leave the answers in the comment box here, for extra entries, post this contest on your blog and sign up to follow my blog. Be sure to let me know you have done so. Winner will be chosen through a random drawing of all of the entries. Agapanthus, Bachelor Buttons and Campanula Beautiful necklace. Ok I’m putting a link on my blog to your contest. 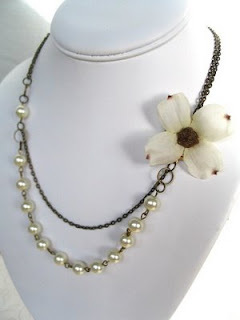 Such a pretty necklace….here’s my flowers: asters, baby’s breath, columbine. I love fun tasks for giveaway chances. Brand new to follow you. *gasp* I’ve been lusting after this necklace for quite some time now. It’s so great to see you all and thanks for entering this contest! I love seeing the different flower names that everyone is coming up with. azalea, buttercup (one of my favorites! ), and calla.. and the necklace is beautiful! Blogged about you and your jewelry here: http://grandiaroad.blogspot.com/2009/05/another-contest.html and signed up to follow you. Amaryllis, Blue Bells, Cornflowers, I added you to my blog list too. Love your blog and all or your beautiful creations! Astillbe, Bugle Weed, canna are my 3 choices. Your jewelry is so lovely!